This week's rainfall was just enough to tease North Texas farmers and ranchers. The agricultural industry has been hit hard by the summer heat and drought, and it is going to take a lot of moisture for crops to make a comeback. Denton County farmer David Schertz said the drought devastated his summer crop. He hasn't harvested any corn, and his hay and grain supplies were nearly wiped out. "It's depressing," he said. "That is just the best way to describe it, I think." 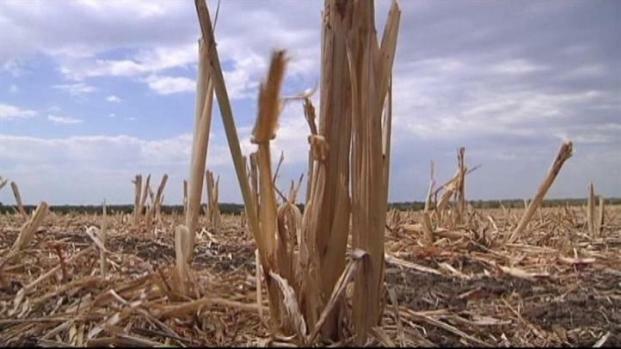 Local farmers are feeling the effects of the drought. His farm in Krum was sprinkled by rain this week. But the showers left as quickly as they came, providing little relief to farmers and ranchers. "We need several inches of rain just to start with," Schertz said. Farmers said they need at least 4 inches of rain before they can plant their winter crops. The soil is too dry right now to support new growth. "We don't have any moisture for the seed to germinate and then sprout and get started or for the roots to reach down to a moisture level to sustain the growth," said Eddie Baggs, Denton County Agricultural Extension agent. Baggs said the winter crop will suffer just like the summer crop unless North Texas get lots of moisture. "It's going to take 15 inches-plus ... spread over a 90-to-100-day period," he said. For now, most farmers said they are hoping Mother Nature will help them out. "It's going to be hard to survive, because you better hope you prepared yourself financially for them situations," Schertz said.